Mailing Address — AmeriCenters, Inc.
Business Mailing Address available in Michigan (Troy, Southfield, Livonia, Bloomfield Hills & Novi), Illinois (Schaumburg & Warrenville) and Ohio (Dublin). Mailbox services, package acceptance, mailing address, private mailbox and mail services. 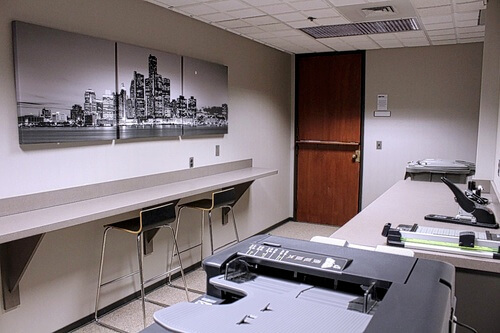 Office Space, Virtual Offices, Mailbox Services and Meeting Rooms available at AmeriCenters. A Business Mailing Address at AmeriCenters will enhance the professional image of your business. With eight prime locations within the Midwest, AmeriCenters is the perfect choice for a prestigious and convenient mailing address for your business. • Professional business mailing address at a prime location. A street address - not a P. O. Box. • Well-appointed lobby & reception area to provide a professional image for your business. • Receive mail and package deliveries (USPS, FedEx, UPS, etc...). • On-site, professional support staff to receive hand-delivered items. • Mail and packages held in a secure location - pick them up at your convenience. We offer a wide range of options (day offices, conference rooms, meeting rooms, advanced telecommunications features, etc...), so you can customize your Business Mailing Address to suit your needs as your business grows.